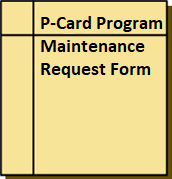 The GW P-Card is a “corporate liability” card; the university pays the monthly bill. A P-Card is issued to a specific individual. The card is used by authorized GW staff, faculty, and student employees, and by designated affiliate fiscal staff to purchase small-dollar items ($3,500) for university use. The authorized cardholder is able to purchase directly on behalf of GW, thereby facilitating tax-exempt purchases. Emergency calls after 5 p.m. weekdays and weekends Call the number on the back of your card. We're pleased to announce the launch of a new GW Procurement Card Application Process with Concur in December, 2018. Complete details, including instructional videos and step-by-step guidelines are available at P-Card Enrollment.